Although not quite Alan Titchmarsh, I've certainly had my fair share of the spotlight this year, with articles about the London Vegetable Garden cropping up in newspapers and websites. The aim has always been to promote urban gardening and encourage those with a lack of space, showing them that they need not be deterred! 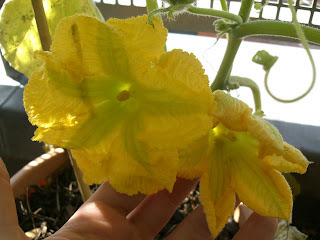 Click below to read any of the London Vegetable Garden articles. Author of 'Crops in Pots' and a fascinating resource of useful advice. I was lucky enough to meet Bob back in the summer and had an insightful conversation with him covering so much! Special thanks to Bob for sharing his passion and helping me to feed mine! A talented chef, great food writer and a passionate urban gardener, Celia was kind enough to reference the London Vegetable Garden in her Times column and has also been a great source of advice and tips, sharing news and views from her allotment! Someone I now converse with a great deal on Twitter, Andy became known to me after following the London Vegetable Garden blog. 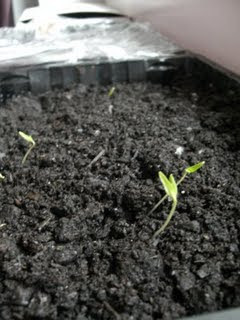 He runs his own superb blog, Chilli Up North, where he chronicles his chilli growing and delicious home-made recipes. His advice has been invaluable over the past nine months, so I'd like to thank him publicly! A jack of all trades, Charles also made contact with me through Twitter and the London Vegetable Garden blog. Since then, we've shared an infectious enthusiasm of urban gardening, perused Columbia Road flower market together and even had a lily-growing competition. A firm friend and a fantastic resource with which to share success stories (and failures), Charles' 'Grumble Garden' is a project and passion close to my own. Again, one of the wonderful green-fingered people I've met through the blog, Kella's blog is a phenomenal source of advice tips and help, and documents the incredible things she grows in abundance in her garden! She's been kind enough to help me over the months with advice and questions – her experience has been invaluable, so thank you! If you would like to meet these people and share your own stories, the London Gardeners' Network is the place for you! Set up after the success of the London Vegetable Garden blog, it is home to over a hundred urban gardeners sharing tips, stories and photos, and is set for big and exciting things in 2010... Click here to visit! Alternatively, if you're addicted to Twitter, why not follow the London Vegetable Garden there? 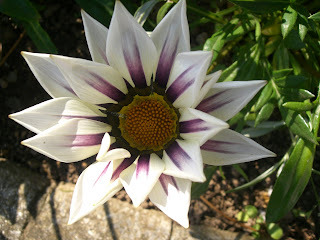 Simply follow @londonveggarden for latest news, gardening tips and blog posts. Quite simply, what an incredible year it's been. It was in fact, only nine months ago that I started the London Vegetable Garden project, although back in April, the 'project' was simply a few seeds and a few scribbles on a brand new blog. As 2009 draws to a close, I've taken time to reflect upon everything that has happened along the way, all of which has accompanied a budding passion for gardening. The original aim of the London Vegetable Garden was to see just what I could (and couldn't!) grow on my small London balcony. Looking back, I'm actually staggered by the range of things I have managed to keep alive and cultivate! Admittedly, the only way I would have been self-sufficient on my produce is if I'd have been a caterpillar, but nevertheless, the diversity has been surprising and enjoyable too. Perhaps one of the easiest things for urban gardeners to attempt, these grow well in sunlight and spring up in only a few weeks. Definitely the easiest thing to have a go with, it's also fantastic to go outside and pick fresh leaves for your salad, rather than messing about with a mushy bag of old salad from the supermarket. Through trial and error, I've determined that radishes like deep pots and a bit of space, so my yield of radishes didn't generate copious amounts of edible produce! 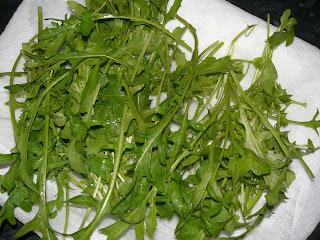 Nevertheless, I did manage to grow two different varieties, both of which were delicious additions to salads! Again, as with the radishes, the humble carrot was a vegetable that took a great deal of trial and error. 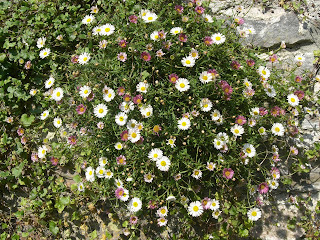 In April's earthy enthusiasm, I sowed rather too liberally, resulting in the plants becoming too crowded. A revised pot containing a very sparse sowing of seeds yielded a far better result, although in 2010 I aim to provide these plants with deeper spaces to grow. 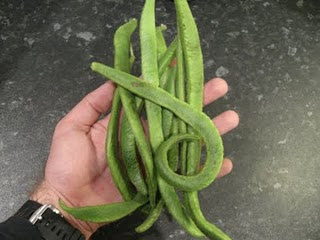 One of the genuine surprises of the London Vegetable Garden, due to the vast space required by the plants, I managed to harvest a good crop of runner beans! These plants require plenty of space for solid root growth, so my bottomless pots on top of grow bags seemed to do the trick. They really were delicious to eat and one of the things I was most proud of. These really were the jewel in the crown! I always thought that I was getting too enthusiastic about the gardening project and that these would prove too difficult to grow without a greenhouse. In a beautiful twist of irony, it turns out that not only were the tomato plants the most successful vegetables (although technically a fruit!) 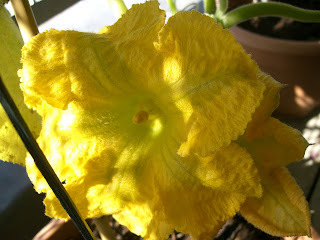 on my balcony, but also the most enjoyable to grow. 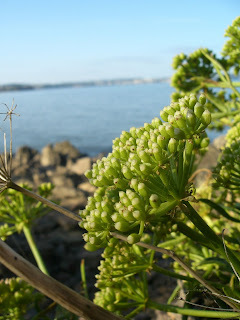 I felt a real affinity with these beautiful plants, watching them grow from delicate saplings to hardy stalked plants. These yielded tonnes of fruit and lasted throughout the summer. 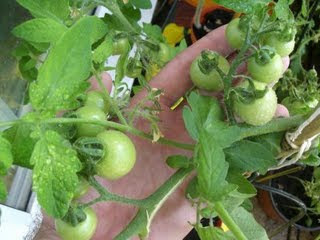 I really have a passion for growing tomatoes and want to attempt different varieties in 2010! I've always endeavoured to be authentic on the London Vegetable Garden. True, it's fantastic when you are able to photograph produce grown from the confines of a tiny urban space, but I've always remained adamant that authenticity is at the forefront of the project. Well, in light of this, it's only natural that I've had some failures along the way! Vegetables such as beetroot and butternut squash have both been valiant attempts, but failed to join the ranks of success. 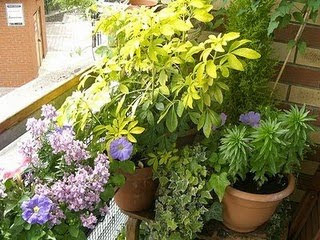 One of the major factors to consider when planting in pots is the lack of depth. I think that planting in the ground affords vegetables plenty of room to grow down, so larger plants and root vegetables need special consideration for urban gardening. Thank you to everyone who has read the blog, commented and been kind enough to provide tips, help and advice. I've enjoyed every second of the journey so far and hope that you'll join me once more in 2010! First off, sincere apologies for the lack of posts. 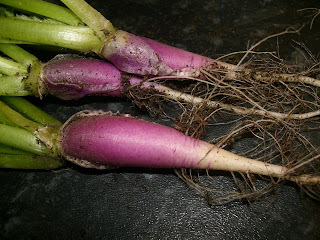 What with the natural advancement of the winter season and increased work demands, giving due time and attention to the London Vegetable Garden blog has been a task harder than growing things in pots these bleak months! There is not a lot happening on the London Vegetable Garden at the moment. I have had some spring onions sat in a pot for a few months now, but progress seems to be terribly slow, which I attribute to the lack of light and warmth. 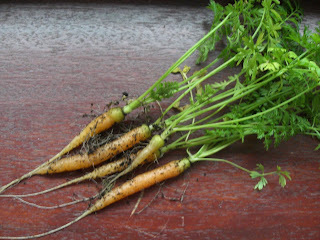 Similarly, I planted some more carrot seeds in September. 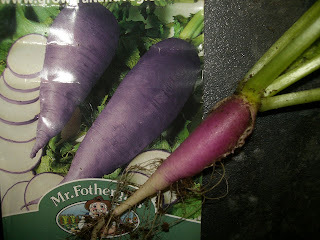 I learnt from my carrot attempts of the spring / summer that I needed to plant these much more thinly, so proceeded to carefully sow a few in a large pot. Well, I read recently that carrot leaves need plenty of sunlight and the past few weeks have been very sparse indeed. The carrot plants seem to have come to a stop, with some of them turning slightly yellow, which I would assume equates to a lack of sunlight. With this in mind (and attempting to yield one more flourish for the blog before we go into 2010) I pulled these up this morning. 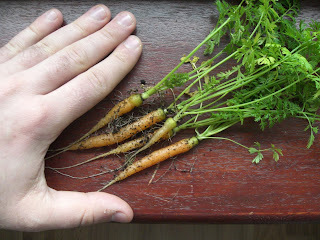 As you can see, these dwarf carrots still remain very small (I have used my large hand for scale! ), however the results are significantly improved. The carrots look a lot healthier than the previous batch and I am attributing this purely to the fact that they have had more room to grow and have not been overcrowded. I have sampled them and the flavour is extremely intense! 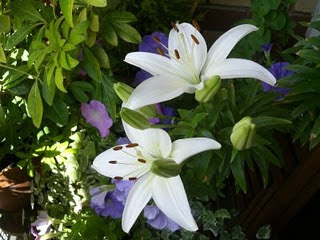 I believe that gardening is all about trial and error and building upon the knowledge you have gained. I propose that come spring, I plant carrot seeds thinly once more, but use a pot that is a lot deeper than the current ones. Hopefully this will encourage deeper root growth and swell the carrots more. So, this afternoon's trip to the local garden centre didn't 'bear fruit', so to speak. With no winter seeds in stock and October only two weeks away, I've had to turn to the Internet for a selection of winter seeds – more to follow on this at a later date. Surrounding this fine floral specimen, I have planted some Sweet William plants (Dianthus Barbatus). Hopefully these will bloom nicely over the coming weeks and add a vibrant display of colour to the London Vegetable Garden balcony. 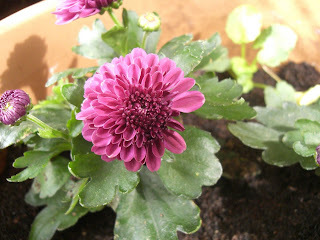 As for the flowers I planted a few weeks ago, the chrysanthemums are starting to swell nicely and the bedding pansies are starting to grow bigger, although show no signs of blooming just yet. 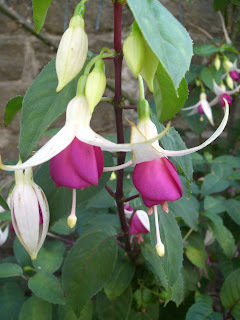 The plants that my girlfriend's father sent down in August have also taken on their own lease of life, with beautiful flowers starting to blossom – if anyone can identify what type of flower / plant this is, I'd be most grateful! 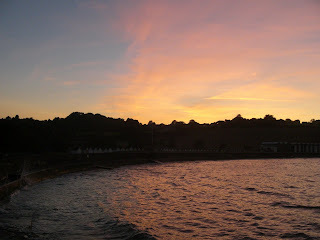 My recent arrival back from a late summer holiday really has marked the end of the summer and the beginning of autumn. The London Vegetable Garden balcony has been very quiet in recent weeks, since I didn't want to grow seedlings and leave these for a week, and many of the summer crops have now gone. So, as I throw myself into my first proper autumn gardening period, what do I have on the go? This has seen plenty of flowers, but no fruits as yet. 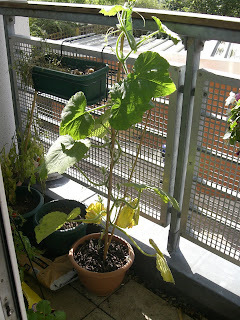 The bottom half of the plant is very withered and the leaves seem to have developed leaf mildew while I was on holiday. I'm not holding out much hope for this plant, but for the moment it's hanging in there – just! Friends on the London Gardeners' Network have told me that spring onions are a great vegetable to grow and easily doable at this time of the year. 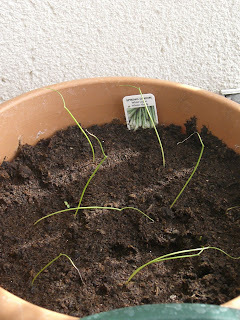 My spring onion plants seem to be doing well and coming up nicely – I've sown them thinly (one of the biggest lessons I've learnt this year), so am hoping for some great, if only a few, vegetables. One of the easiest and quickest of plants to grow, lettuce leaves have been part and parcel of the London Vegetable Garden since April. The best results have come from leaves planted in a window box, but I've also managed to grow good crops in these shallow trays, of which these are the latest crop. 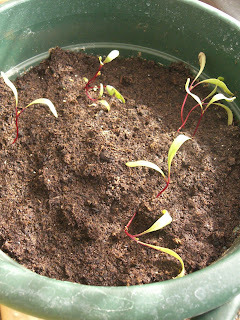 I'm not sure how these will turn out, especially now that the nights are getting colder and these beetroot plants are still relatively young. 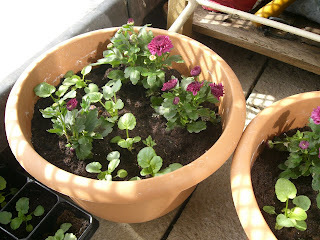 The ones on the middle right of the picture have been planted from seed in this pot; the ones in the bottom left have been transplanted from smaller flowerpots. The ones on the right look stronger, but I'm not holding out much hopes for these guys at the moment! Now, for those of you that have been with me since the beginning, you'll remember my over-zealous enthusiasm led to a condensed carrot conundrum! 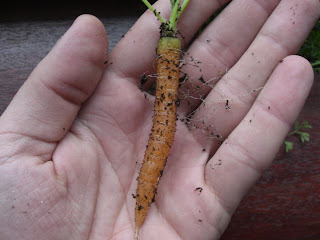 I planted far too many seeds and in the end, this killed the carrot crop off. 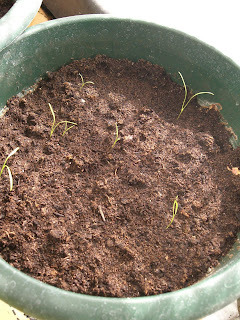 This time, I have literally sown about five dwarf carrot seeds in a pot and already, they seem to be growing much faster. If I can get a couple of good carrots from this experiment, I'll be happy! So that's it at the moment! I'm planning on looking at winter seed planting this afternoon, so may possibly follow up with another new blog post this afternoon. In the meantime, if anyone has any tips for me and my current selection, please leave a comment on this blog post, or come and join the London Vegetable Garden community over at the London Gardeners Network! 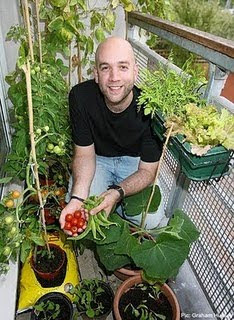 One of the very (few) real benefits of gardening on an urban balcony, is that high-rise gardeners are not plagued with pests. I've had many a conversation with fellow gardening enthusiasts bemoaning the snails and slugs wreaking havoc on their plots! Well, it seems that nature always finds a way: when clearing the old tomato plants from the London Vegetable Garden yesterday, I came across not one, but two visitors to the balcony. I can only imagine that this tiny slug and his little worm friend arrived in some bedding plants! Aside from the obvious environmental benefits of growing your own produce (not to mention the reduction in food waste), one simply can't ignore the aesthetic qualities of gardening. Growing plants and flowers for visual pleasure has been a time-honoured past-time throughout civilisation and one that evokes images of country houses, landscaped gardens and public parks. So how does a bleak pavement in an industrial area fit into this? Whilst much of Hackney is rapidly being gentrified in preparation for the forthcoming 2012 Olympic games, many parts of it remain bleak, industrial and run-down. In areas such as these, gardening seems an impossibility – or does it? 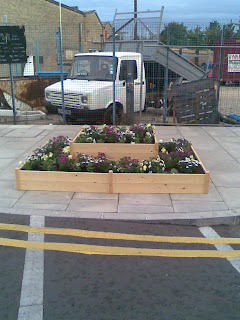 This week I was pleasantly surprised to notice this large flower bed had suddenly appeared in the middle of the pavement! 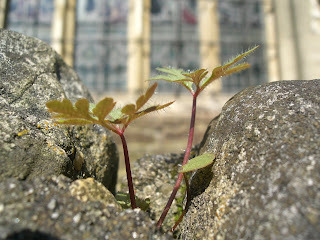 Guerrilla gardening is becoming much more prevalent in urban areas, due in part to a number of reasons. Fed up with local authorities dragging their heels over planning permission and bureaucratic red tape, many urban city dwellers are taking affirmative action and constructing urban garden displays overnight. Although guerrilla gardening is not a new concept, its prevalence is certainly increasing. I was genuinely surprised to see this flower display pop up and I think you'll all agree, it makes such a difference to the bleak surroundings. A friend of mine lives in the locale and has already seen neighbours watering the flowers and talking to each other about its sudden appearance. What a wonderful way to highlight the pleasure people can derive from gardening – and the fact that guerrilla gardening in particular, shows that community spirit is not as dead as we feared. Last autumn / winter, I planted some pansies in window boxes and pots which lasted through the bleak mid-winter months and added some much appreciated colour to the London Vegetable Garden balcony. Now that we've entered September, I've spent some time gearing up the botanical side of the London Vegetable Garden for the coming months. 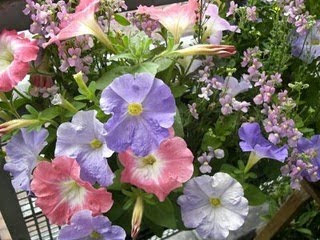 I managed to track down some cheap bedding plants which included mixed pansies and chrysanthemums (Regal Cheryl). 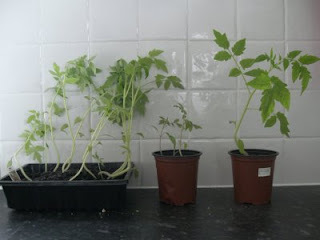 As you can see from the picture below, they are in their infant stages at the moment, but hopefully once they've grown, they'll add a splendid range of colour to the London Vegetable Garden balcony. These beautiful plants have a higher spread and height than pansies, so I have made these the focal point, planting in the centre and rear of the pots, with pansies dotted around in between and at the front. Hopefully, these will grow nicely together! 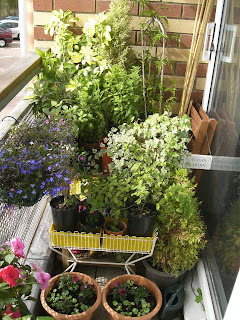 The balcony also has a wooden table on which I have moved the tall plants to the back, with trailing ivy at the front. This acts as a natural green 'curtain' to cover up my gardening tools, compost etc. which are located under the table! 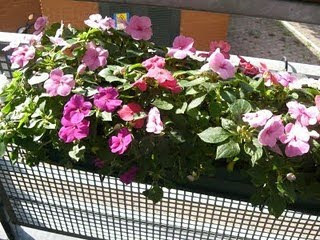 In front of this we have a vintage plant stand with pots growing in and then the chrysanthemum / pansy pots at the front. I'm hoping that when these plants flower, the whole effect will look like a staggered wall sloping down from the back to the front. 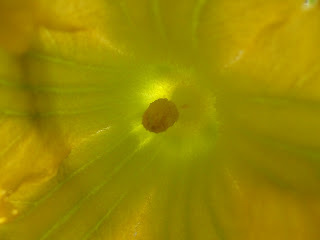 My temperamental butternut squash plant has suddenly taken me back to my formative teenage years. Hours of preparation in the shower, hair gel ladled on (something no longer necessary), new clothes and plenty of cheap aftershave. Why am I regaling you with stories from my past? Because my butternut squash is turning out to be like the parties I went to as a teenager – full of guys without a girl in sight! I'm not sure whether this thread bears any interest to followers of the London Vegetable Garden, but for the budding botanists amongst you, here is an update on the spider plant! 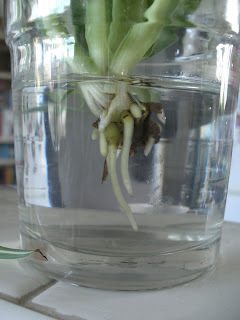 I plan to keep this plant in the water purely to see how long it keeps growing like this. Watch this space! Yes indeed; I have holey radishes! 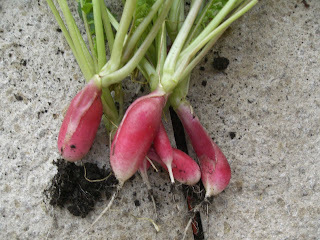 A few months ago, I reported that the London Vegetable Garden's first attempt at growing radishes had ended in success, although with a lot of room for improvement. I'm not sure what it is that's causing these holes, since the London Vegetable Garden's relative height acts as a good deterrent for pests. Are my radishes being attacked by some unseen pest? Will these holes affect their capacity for growth? Will I get any more radishes this year? I'm hoping that I'll have answers to these questions, along with some pictures of crops, very shortly! Two urban gardeners. Two Cobra Lily bulbs. One London Lily-Off Championship 2009. You know the score – it's Grumblegarden's Charles verus myself. Here's the latest snap of my Cobra Lily, that looks set to flower despite being only six inches in height! Is the London Vegetable Garden set to win the world's first official 'Lily-Off'? Can Charles come back with anything more impressive than my botanical beauty? Stay tuned folks! 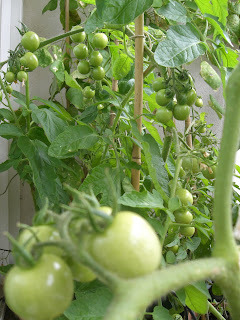 It was only back in April that I decided to plant a few tomato seeds and blog about the process. Five months on and what started as an interesting project has developed into a full-grown passion, with an abundant crop of sweet tomatoes the fruit of my labours, in every sense of the phrase! As you all know by now, the London Vegetable Garden is a big (well, little) experiment, that aims to show urban gardeners just how much is possible, even when challenged with a small space in the city. These tomatoes have lived quite happily out on the balcony for months – no greenhouse, cloche or trickery; just a grow bag, a weekly tomato feed, plenty of water and daily attention! Looking back, I remember saying how hard I thought it would be to grow such a demanding plant, but caring for these tomatoes has been an absolute joy. As they crop starts to slow and trusses dry up, it's clear that my tomato supply is beginning to run out for the year, but the whole process has been incredibly enjoyable. Several of you have written to me (both here and on the London Gardeners' Network) and have been kind enough to have shared your tomato-growing experiences. 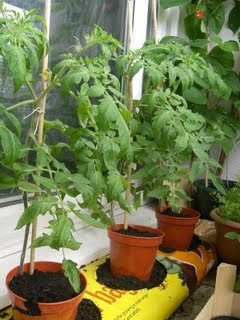 Tumbling tomatoes are a clear favourite amongst space restricted London gardeners, along with grow bags on balconies. From my experiments and the experiences you've shared with the London Vegetable Garden community, urban tomato growing is nothing less than a clear winner – gardening that can be enjoyed by any urban city dweller.